Citation: Imad J, Wehbe T, Jaoude EA. A comparative study of three non-nutritive sweeteners effects on insulin and glucose in healthy, nondiabetic adults. Insights Nutr Metabol. 2017;1(2):73-79. Copyright: © 2017 Imad J, et al. This is an open-access article distributed under the terms of the Creative Commons Attribution License, which permits unrestricted use, distribution, and reproduction in any medium, provided the original author and source are credited. Non-nutritive sweeteners, Diabetes, Metabolic syndrome, Insulin resistance. Non-Nutritive Sweeteners (NNS) are sugar substitutes that provide a sweet taste with few, if any, calories. Because NSS can improve and enrich the palatability of several artificially manipulated foods, they are widely used in several nutritional industries. Most beverages, ice cream, chewing gum, chocolate, jams, jellies, yogurt and salad dressings use different NNS. The U.S. National Health and Nutrition Examination Survey data showed the consumption of the NNS between 1999 and 2008 to have risen from 18.7% to 24.1% among adults, and from 6.1% to 12.5% among children [1-3]. Although NNS may help weight loss modestly in some cases, the increased quantitative consumption of NNS especially during pregnancy has been shown to rather increase the prevalence of obesity. Eight ingredients used in NNS have been approved by the U.S. Food and Drug Administration namely sucralose, saccharin, aspartame, acesulfame potassium (K), neotame, stevia, advantame and Luo han guo extracts. Several studies have demonstrated a link between some of those NNS and high levels of insulin or blood glucose and raised the suspicion that artificially sweetened beverages may increase the risk of type 2 diabetes (T2D) [4-6]. 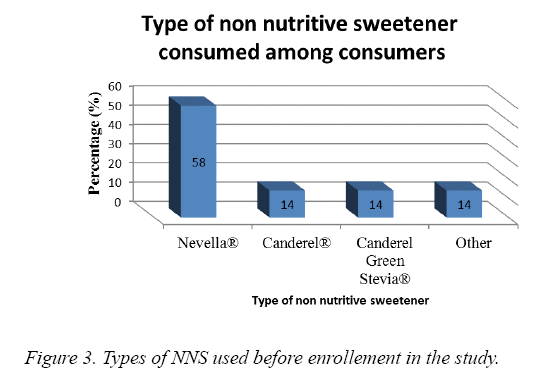 Canderel®, Nevella® and Canderel Green Stevia® are three types of NNS that differ in their composition. They are among the most used in the Lebanese market. Nevella® is made of sucralose (1.2%), maltodextrin and Bacillus coagulans. It is available in powder form or packets. One packet contains 125 million colony-forming units (CFU) of Bacillus coagulans and one teaspoon in powder form contains 62.5 million CFU of Bacillus coagulans. Each teaspoon of Nevella® powder is equal in sweetness to one teaspoon of sugar and contains 0.5 g of carbohydrates with negligible amount of sodium providing only 2 calories . Canderel® is made of maltodextrin, aspartame, acesulfame K and maltol. Each teaspoon contains 7.1 mg of aspartame and 4.7 mg of acesulfame K; which is equal in sweetness to one teaspoon of sugar. Canderel® contains 0.47 g of carbohydrates and 0.01 g of protein per teaspoon which provides 1.9 calories . Canderel Green Stevia® is made of the sweetest extract of the stevia plant, Rebaudioside A (2.2%) and maltodextrin. Stevia plant is grown in South America where it was used as a natural sweetener for hundreds of years. It is 200 times sweeter than sugar containing 0.47 g of carbohydrates and 1.88 calories per teaspoon which is equal in sweetness to one teaspoon of sugar . Hyperinsulinemia is associated with hypertension, obesity, dyslipidemia, glucose intolerance, and insulin resistance; collectively these consist of a metabolic syndrome linked to diabetes and pre-diabetes. Testing accurately for insulin resistance is a difficult task but one simple method consists of measuring insulin levels before and 1 h after orally administering 75 g of glucose dissolved in water [10-12]. Hyperinsulinemia results from defects in insulin action on its receptor, impairing glucose uptake by the tissue and contributing to the development of hyperglycemia. The result is loss of normal insulin secretion, increased hepatic glucose production and a rise of the inflammatory cytokines in the plasma. Hyperglycemia and hyperinsulinemia are independent risk factors for mortality [13,14]. Aspartame found in Canderel®, used during the perigestational period has been shown to cause obesity and induce the metabolic syndrome in the offspring. Another risk is cancer of the urinary tract in long term users [15-17]. Different studies with conflicting results suggested that NNS administration that contains aspartame increased glucose tolerance, insulin level and triglycerides compared to water [18-20]. Malaisse et al. demonstrated that at high concentration, acesulfame K increases glucose absorption via a GLUT2-dependent mechanism and increases insulin secretion . Pepino et al. found that sucralose affected glycemic and insulin responses to an oral glucose load in obese people who were not regular consumers of NNS and did not have insulin resistance. Conversely, Brown et al. and Ma et al. demonstrated that sucralose was similar to water and had no effect on blood glucose or insulin concentrations in healthy subjects. Grotz et al. further showed that sucralose has no effect on glucose levels in subjects with T2D. Stevia and Stevioside were shown to have anti-diabetic effects lowering fasting glucose, insulin levels, glucose tolerance and insulin sensitivity, an effect similar to insulin regulation of glucose entry into the cells [25-28]. Thirty five subjects, 17 males and 18 females, were randomly selected, between August 2014 and April 2015, from different regions meeting the inclusion criteria. A questionnaire was completed by the participants that included questions about age, level of physical activity, medications, presence of any health issues, if any, family history of metabolic diseases, smoking habits, and nutritional information. Height (cm) and weight (kg) were taken by a nutritionist. The study design was approved by the ethics committee of the Department of Human Nutrition and Dietetics in the Faculty of Agricultural and Food Sciences at The Holy Saint Spirit University. All participants consented in writing. The inclusion criteria stated that subjects had to be 18-40 years old, with BMI between 18.5-25, who do not consume NNS on a daily basis with none of the exclusion criteria as follows: subjects who are diabetics or known to have hyperinsulinemia, pre-diabetes or insulin resistance. Participants taking any diabetic medications for other reasons like polycystic ovaries or to lose weight, subjects who had bariatric surgery or who had liver or renal disease, pregnant ladies, smokers, those on any hormone replacement, having phenylketonuria, Galactosemia, high daily stress, allergy to NNS, have dyslipedimia, waist circumference >94 cm for men and >80 cm for women. Seven subjects were randomly assigned to each of the 5 groups. Group 1 received 9 g of Nevella®, group 2 recieved 9 g of Canderel Green Stevia®, group 3 received 9 g of Canderel®, group 4 received water and group 5 received 75 g of glucose. The subjects had to be healthy, aged 18-40, non-obese (BMI of 18, 5-25 Kg/m2), waist circumference under 94 cm for males and under 80 cm for females. Diabetics, persons with insulin resistance, dyslipidemia, liver or kidney dysfunction were excluded, smokers, pregnant or nursing mothers, patients on hormonal replacement or polycystic ovary syndrome were also excluded. Subjects were asked to stop the consumption of NNS for 1 month prior to the test. Blood was drawn fasting and 1 h after ingestion of the specified solution to test for glucose and insulin levels. Participants were asked to refrain from physical activity or effort during the one hour waiting period. A digital food scale was used to measure the 9 g of NSS which is equivalent in volume and sweetness of 75 g of glucose determined by a graduated cup. The 9 g of Canderel® contained 191.70 mg aspartame, 126.90 mg acesulfame K and 8.43 g maltodextrin; the 9 g of Nevella® contained 108.00 g sucralose, and 8.8 g maltodextrin and the 9 g of Canderel Green Stevia® contained 198.00 mg Rebaudioside A and 8.45 g of maltodextrin. The glucose level was measured using the enzymatic method with hexokinase, while the insulin level, was measured using the Elisa sandwich principle using the Biotin-Streptavidin complex. All statistical analysis was performed using the Statistical Package for Social Sciences (SPSS) version 21.0 to describe the effects of NNS used, on insulin and glucose level. A paired t-test was used for each group to study the difference between the responses measured, and a One Way ANOVA with bonferroni post hoc test was used to compare the groups. Moreover, the comparison of the results between genders was done using Mann-Whitney Test. The significance was considered at p-value less than 0.05. Our study enrolled 35 subjects, 17 (48.5%) were males and 18 (51.5%) were females. The mean age was 25.06 years ± 4.07 ranging between 19 and 35 years. The mean BMI was 22.68 Kg/m² ± 1.88 ranging between 18.60 and 24.90 Kg/m². The waist circumference ranged between 68 and 79 cm among females, with a mean of 75.60 cm and between 80.00 and 92.00 cm with a mean of 85.50 among males (Figure 1). 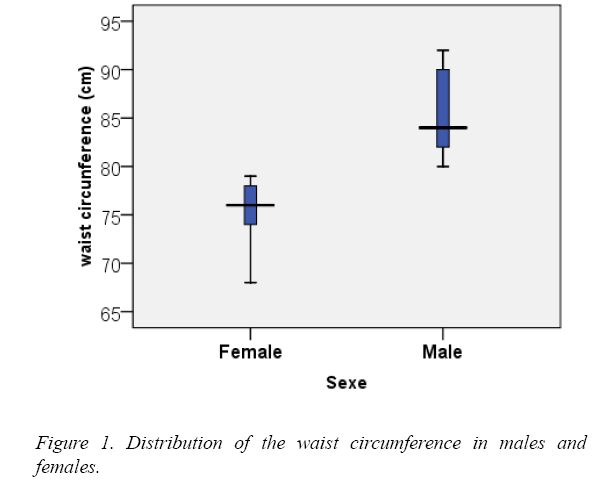 Figure 1: Distribution of the waist circumference in males and females. The majority of the subjects engaged in physical activity 3 to 5 times per week (67%). 24% exercised 1 to 2 times per week and 9% were physically active daily (Figure 2). Figure 2: Distribution of the sample according to weekly physical activity. At baseline, NSS intake per week was 0.92 ± 1.74 times ranging between 0 and 5.58% of our subjects (Figure 3). The majority used Nevella While 14% used Canderel® and 14 % used Canderel Green Stevia®. Figure 3: Types of NNS used before enrollement in the study. Before enrollment, 55% did not consume sugar free juices while 6% consumed it 1 to 2 times per week and 18% were occasional consumers. Forty percent (40%) of the subjects consumed sugar free gums and candies occasionally while only 15% consumed it 1 to 2 times per week and 15% did not use it. Fifty eight percent (58%) of the subjects do not consume sugar free sweets while 21% consumed it occasionally. Twenty eight percent (28%) of the subjects do not consume diet beverages while 24% used it 1 to 2 times per week, 39% used it 3 to 5 times per weeks. Increased insulin significantly (p=0.002 and p<0.001, respectively). Water decreased it significantly (p=0.012) (Table 1). There was no difference between genders in all groups as far as glucose and insulin level variation (p>0.05 in all groups). We found that no difference was evident between all NNS as compared to water on the effect of blood glucose (p>0.05 in all NNS groups), but the glucose solution consumed by group 5 had the highest rise in blood glucose. Table 1: The effect of Canderel®, Nevella®, Canderel Green Stevia®, water and glucose on fasting and PP (post prandial) glucose and insulin levels. We found a significant difference in blood glucose across the 5 groups (p<0.001). Post-hoc analysis using the Bonferroni test the difference was found in the glucose solution which caused the highest rise in blood glucose (Table 2). Table 2: Difference in blood glucose between the five groups. We also found a significant difference in insulin levels across the 5 groups (p<0.001). All NNS were different from glucose. No significant difference existed between Nevella®, Canderel Green Stevia® and water but a significant difference was found between Canderel® and water (p<0.001) (Table 3). Table 3: Difference in insulin levels between the five groups. Post prandially, glucose increased the insulin levels more than any NNS. No significant difference was found between Nevella®, Canderel Green Stevia® and water (p>0.05). On the other hand, a significant difference in the insulin level was found between Canderel® and water (p<0.001). Glucose was the only product that increased blood glucose levels while water decreased it compared to the NNS groups. The blood glucose levels in a descending order were seen with Glucose, Nevella®, Canderel Green Stevia®, Water. The difference was significant (p<0.05) (Figure 4). Insulin levels were significantly increased in the glucose and Canderel® groups, raised slightly in Nevella® and Canderel Green Stevia® and, decreased in the water group. The insulin levels from the highest to the lowest were with Glucose, Canderel®, Canderel Green Stevia®, Nevella® and Water. The P value was only significant for glucose and Canderel®(p<0.05) (Figure 5). Figure 4: Mean levels of blood glucose at fasting and 1 h after the consumption of Canderel, Nevella®, Canderel Green Stevia®, water and glucose. 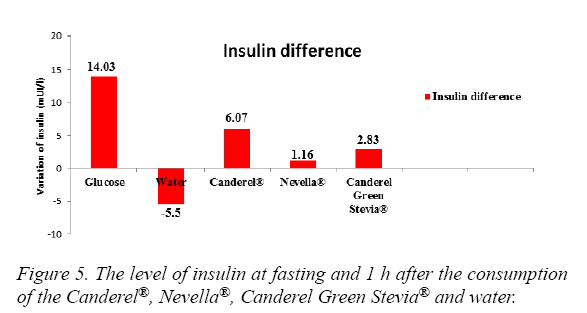 Figure 5: The level of insulin at fasting and 1 h after the consumption of the Canderel®, Nevella®, Canderel Green Stevia® and water. The present study was designed to evaluate the effects of commonly used NNS on insulin and blood glucose. The water acted as our negative control and the glucose as our positive one. All subjects were chosen to be healthy, non-diabetic, active adults who do not consume NNS daily. Nevella®, made from sucralose, maltodextrin and Bacillus coagulans was reported by Pepino et al. not to be metabolically inert in obese subjects and he showed an increase in blood glucose and insulin levels as compared to water. Our study did not confirm these results. Nevella® did not have an effect on blood glucose or insulin compared to water. In our group, Nevella® had the same effect as water on blood glucose and insulin. In line with our findings, Brown and others reported similar results [22,23]. There was no difference between genders in the Nevella® group. The other ingredients combined with sucralose in Nevella® do not seem to have any metabolic effects on blood glucose or insulin . Canderel® which contains aspartame and acesulfame K increased significantly insulin levels but did not show an effect on blood glucose levels in healthy adults. Our findings were similar to Mitsutomi et al. who found that NNS containing aspartame did not increase blood glucose but did increase insulin as compared to water . Canderel Green Stevia® contains an extract of stevia plant Rebaudioside A and maltodextrin. Many studies found that stevia did not have an effect on glucose or insulin and this was in line with our results although those studies were performed on rats. Anton et al. showed that insulin and glucose were significantly lower in the presence of stevia as compared to aspartame in concert with our results [25,28,30,31]. Only Canderel® increased insulin levels significantly among NNS. Subjects at risk of T2D are advised to avoid consuming Canderel® and the widely used aspartam to prevent the potential beta cell defects caused by hyperinsulinemia. Others like Fagherazzi et al. proved that sugar free beverages increased the risk of T2D in women . Canderel Green Stevia® and Nevella® were not shown to have these deleterious effects. NNS are commonly used sugar substitutes especially by diabetic subjects. Our results clearly show that the effects of Nevella® and Canderel Green Stevia® mimic water effects on insulin levels. Many commercially available brands contain ingredient found in Nevella® and Canderel Green Stevia® such as Splenda®, Sucrapharm® and Greenlite®. Canderel® contains maltodextrin, aspartame, acesulfame K and maltol which we showed, increase insulin levels, are not metabolically inert and may pause a risk for the development of T2D. Canderel® may cause hypoglycemia by raising insulin and may result in weight gain rather leading to obesity. The differences between our results and some reports in the literature may be due to the other ingredients and a different choice of the population enrolled. Beverages, gums, candies, yogurt, ice cream, chocolate, biscuits and juices containing aspartame and acesulfame K have similar ingredients to Canderel®. Shankar P, Ahuja S, Sriram K. Non-nutritive sweeteners: Review and update. Nutrition. 2013;29:1293-99. Sylvetsky A, Welsh J, Brown R, Vos M. Low-calorie sweetener consumption is increasing in the United States. Am J Clin Nutr. 2012;96:640-6. Gupta S, Mahajan V, Mahajan, S, et al. Artificial sweeteners. JK Sci. 2012;14:2-4. Fitch C, Keim K. Position of the academy of nutrition and dietetics: Use of nutritive and non-nutritive sweeteners. J Acad Nutr Diet. 2012;112:739-58. Malaisse W, Vanonderbergen A, Louchami K, et al. Effects of artificial sweeteners on insulin release and cationic fluxes in rat pancreatic islets. Cell Signal. 1998;10:727-33. De Koning L, Malik V, Rimm E, et al. Sugar-sweetened and artificially sweetened beverage consumption and risk of type 2 diabetes in men. A. J Clin Nutr. 2011;93:1321-7.
http://www.nevella.com/original/ Accessed September 1st, 2017.
http://www.canderel.co.uk/canderel-red/tablets Accessed September 1st, 2017.
http://www.canderel.co.uk/canderel-green/products Accessed September 1st, 2017. Ye J. Role of insulin in the pathogenesis of free fatty acid-induced insulin resistance in skeletal muscle. endocrine, metabolic & immune disorders. Drug Targets. 2007;7:65-74. Ye J. Mechanisms of insulin resistance in obesity. Front Med. 2013;7:14-24. Hucking K, Watanabe R, Stefanovski D, et al. OGTT-derived measures of insulin sensitivity are confounded by factors other than insulin sensitivity itself. Obesity (Silver Spring). 2008;16:1938-45. Guo S. Insulin signaling, resistance and the metabolic syndrome: Insights from mouse models into disease mechanisms. J Endocrinol. 2014;220:T1-23. Rao A, Freishtat R, Jalagadugula G, et al. Alterations in insulin-signaling and coagulation pathways in platelets during hyperglycemia-hyperinsulinemia in healthy non-diabetic subject. Thromb Res. 2014;134:704-10. Fowler S, Williams K, Resendez R, et al. Fueling the obesity epidemic? Artificially sweetened beverage use and long-term weight gain. Obesity (Silver Spring). 2008;16:1894-900. Raben A, Vasilaras T, Møller A, et al. Sucrose compared with artificial sweeteners: Different effects on ad libitum food intake and body weight after 10 week of supplementation in overweight subjects. Am J Clin Nutr. 2002;76:721-9. Andreatta M, Munoz S, Lantieri M, et al. Artificial sweetener consumption and urinary tract tumors in Cordoba, Argentina. Prev Med. 2008;47:136-9. Mukherjee M, Sarkar A. Sugar content in artificial sweetener. Adv Appl Sci Res. 2011;2:407-9. Collison K, Makhoul N, Zaidi M, et al. Interactive effects of neonatal exposure to monosodium glutamate and aspartame on glucose homeostasis. J Nutr Metab.2012;9:58. Zheng, Y, Sarr MG. Effect of the artificial sweetener, acesulfame potassium, a sweet taste receptor agonist, on glucose uptake in small intestinal cell lines. J Gastrointest Surg. 2013;17:153-8. Pepino MY, Tiemann CD, Patterson BW, et al. Sucralose affects glycemic and hormonal responses to an oral glucose load. Diabetes Care. 2013;36:2530-5. Brown A, Bohan Brown M, Onken K, et al. Short-term consumption of sucralose, a non-nutritive sweetener, is similar to water with regard to select markers of hunger signaling and short-term glucose homeostasis in women. Nutr Res. 2011;31:882-8. Ma J, Bellon M, Wishart J, et al. Effect of the artificial sweetener, sucralose, on gastric emptying and incretin hormone release in healthy subjects. Am J Physiol Gastrointest Liver Physiol. 2009;296:G735-9. Grotz V, Munro I. An overview of the safety of sucralose. Regul Toxicol Pharmacol. 2009;55:1-5. Wang Z, Xue L, Guo C, et al. Stevioside ameliorates high-fat diet-induced insulin resistance and adipose tissue inflammation by downregulating the NF-kappa B pathway. Biochem Biophys Res Commun. 2012;417:1280-5. Shivanna N, Naika M, Khanum F, et al. Antioxidant, anti-diabetic and renal protective properties of Stevia rebaudiana. J Diabetes Complications. 2013;27:103-13. Lailerd N, Saengsirisuwan V, Sloniger J, et al. Effects of stevioside on glucose transport activity in insulin-sensitive and insulin-resistant rat skeletal muscle. Metab Clin Exp. 2004;53:101-7. Rizzo B, Zambonin L, Angeloni C, et al. Steviol glycosides modulate glucose transport in different cell types. Oxid Med Cell Longev. 2013;2013:348169. Mitsutomi K, Masaki T, Shimasaki T, et al. Effects of a non-nutritive sweetener on body adiposity and energy metabolism in mice with diet-induced obesity. Metabolism. 2014;63:69-78. Anton SD, Martin CK, Han H, et al. Effects of stevia, aspartame and sucrose on food intake, satiety and postprandial glucose and insulin levels. Appetite. 2010;55:37-43. Duque-Guimaraes D, Ozanne S. Nutritional programming of insulin resistance: Causes and consequences. Trends Endocrinol Metab. 2013;24:525-35. Fagherazzi G, Vilier A, Saes Sartorelli D, et al. Consumption of artificially and sugar-sweetened beverages and incident type 2 diabetes in the Etude Epidemiologique aupres des femmes de la Mutuelle Generale de l'Education Nationale-European Prospective Investigation into cancer and nutrition cohort. Am J Clin Nutr. 2013;97:517-23.